Or: "John and Renée get carried away for Christmas." What is all this? 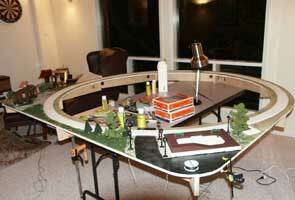 Well, it's a long story... John's friend Tom has two young sons and they love to play with Lionel trains. 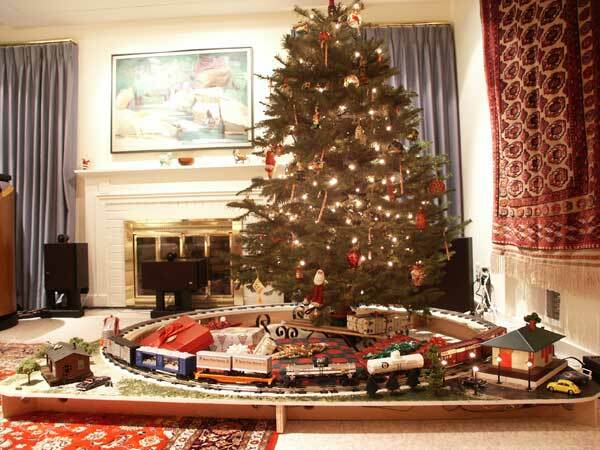 John decided in October that he needed a layout around the tree at Christmas and bought a Lionel O-72 circle of track and a diesel and a few cars. Then, the stuff sat until mid-December. 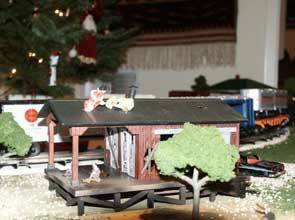 When the Christmas tree went up on December 13, John and Renée laid the circle around the tree and ran the train. This wasn't very satisfactory because the track was fragile and the floor wasn't very flat because part of the track went up on a rug. Somehow, the idea of making something to support the track developed and as sometimes happens (often around here), things got carried away. 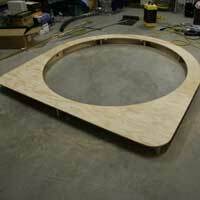 Two sheets of ½" plywood were cut to the right side and joined using a spline the full length. 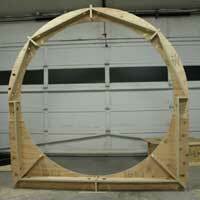 Then the underside structure was added. Eight bridges at 45° angles were added to support the track radially and stringers were added between the bridges to give stiffness. Additional stingers were also used at the front for the extra scenery areas. Finally, the center was cut out and the outside was cut to shape. The photos above show three views of the benchwork: a view from the top, of the bottom and a close-up showing one bridge and two stringers. 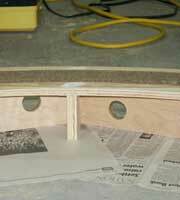 (The holes were drilled to allow wires to be routed underneath the layout.) This resulted in a structure that was still light, while being stiff even with very little surface for its size. 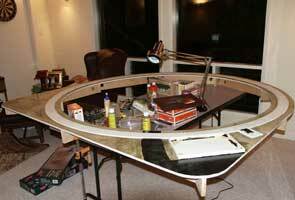 After the rough painting, the layout came indoors for the final phases. (It's too cold in the garage, plus it was raining very hard in late December, 2002). Above you can see the scenery steps, kept very simple to make them go fast. 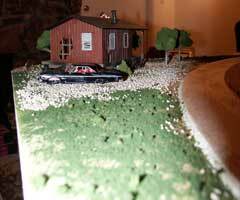 The entire area aside from the roadbed was painted with a brown wash to give a base coat. The road was painted with thin black paint. 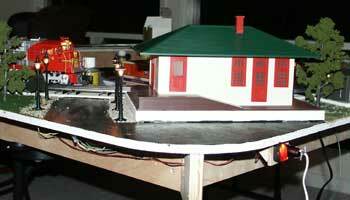 Renée chose the Lionel station and Hobo Shack buildings for the layout so the two corner spaces were laid out for the structures. 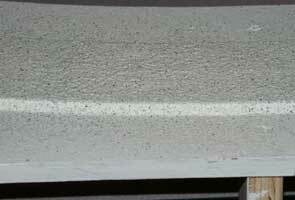 The station required a foundation so John made a quick foundation out of balsa and painted it to look like concrete. Trees were planted and grass and gravel ground cover was added and glued in place using the method of dilute white glue sprayed on after the scenic materials were applied. Renée did most of this work and planned the layout of the hobo shack area. And on Thursday night it was ready to go under the tree. 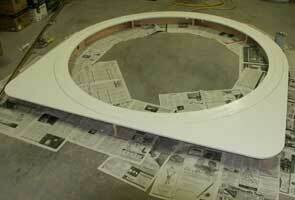 The project started on Saturday evening and finished Thursday night. 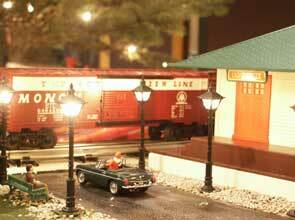 A Christmas layout in only six days!